Naptime - Quality products handcrafted to enhance your sleep. You won’t want to get out of bed! Enter SINGLES OR BED-BUYER at https://naptime.com.au and receive up to $100 off on your Naptime Mattress courtesy of Bedbuyer! • BED-BUYER : This discount code entitles you to $100 off the recommended retail price of the Naptime Mattress King or Queen agreed to by both Bedbuyer and Naptime. • SINGLES : This discount code entitles you to a further 15% OFF the price of the Naptime Mattress Single, King single and Double agreed to by both Bedbuyer and Naptime. 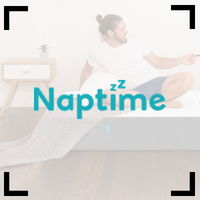 The Naptime Mattress was recently awarded Australia’s ‘Best Value’ Mattress in a Box for 2019. It is one of the most affordable mattress in a box products in Australia and surprisingly, one of the best. Naptime have just released a new model for 2019 called the Naptime 2.0 Coil, which is a spring based version of their original foam based mattress. Enter NAP-COMBO at https://naptime.com.au/ and receive $250 off any Combo Mattress + Bed Base, courtesy of Bedbuyer! • This discount code entitles you to $250 off the price of any Combo Mattress + Bed Base agreed to by both Bedbuyer and Naptime. Enter NAP-KIT at checkout and get 15% OFF any size Naptime mattress protector ! Enter NAP-KIT at checkout and get 15% OFF your Mattress topper, courtesy of Bedbuyer. The Naptime Mattress Topper is designed to fit all standard size mattresses.